The food spectrum consists of Mice, Rats, Frogs, Earthworms and small mammals. At the age of five months there is hardly any difference in plumage between the old and young and the wingspan is then in its fully-grown state of approx. 100 cm. Only half the young birds survive the first year. 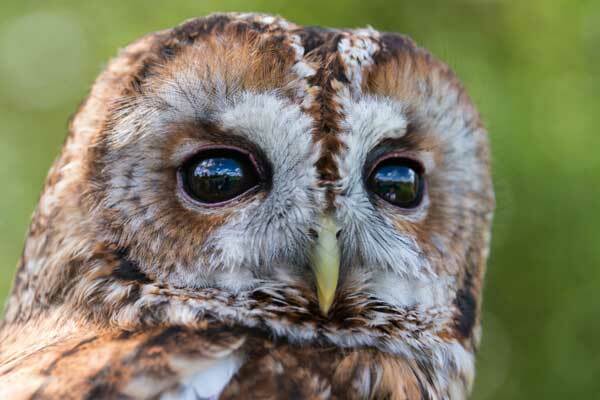 Its German name “Waldkauz” (small forest owl) indicates its original habitat. It is most comfortable in open deciduous forests and mixed woodlands. 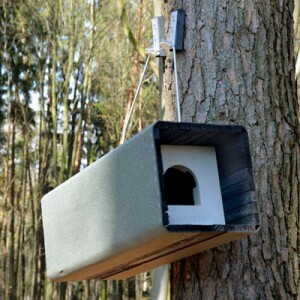 If it can’t find a suitable tree hollow as a daytime hideaway or breeding cavity, it also accepts quiet places on buildings, barns, rocky ground and eagerly welcomes species-appropriate nest boxes and elongated breeding enclosures. 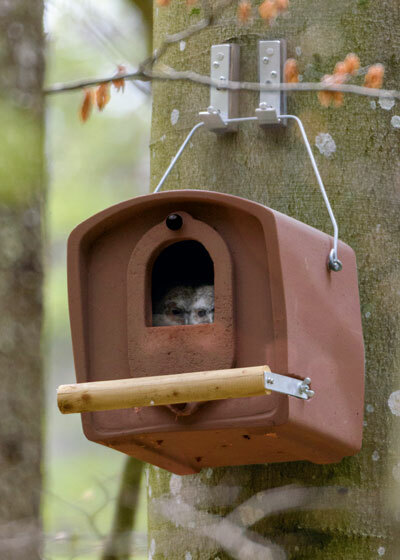 But as natural and suitable breeding places become ever more scarce, this Owl species increasingly suffers from housing shortage. 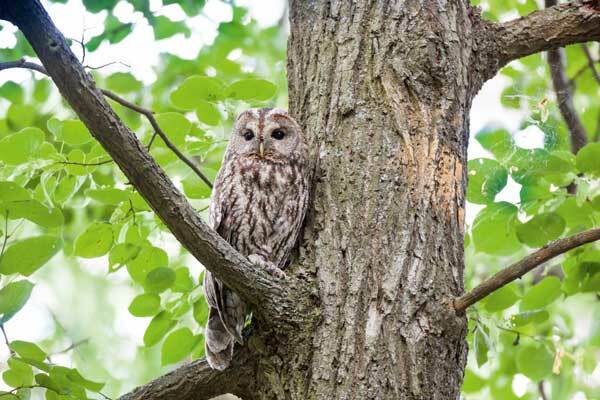 Monotonous forests (with small ratio of deadwood), parks and young managed forests in particular do not – or only conditionally – provide suitable breeding ground and daytime hideaways for the Tawny Owl. 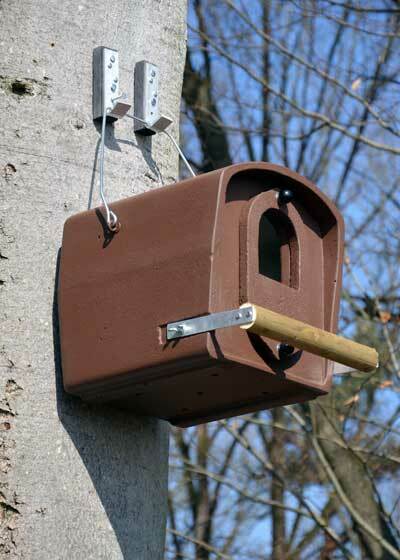 Installation: It is advisable to install one to two nest boxes in an area of approx. 50 ha. Natural prey: Hawks, Eagle Owls and disease. 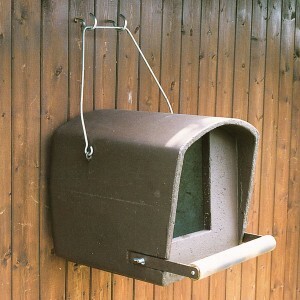 Do not install: In the territories of Eurasian Pigmy Owls, Boreal Owls and Little Owls. Siting: forests, buildings, rock faces, etc. 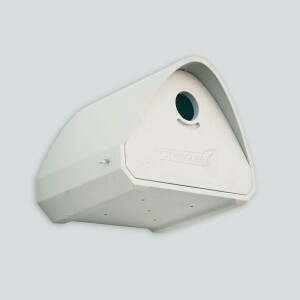 Installation height: from 4 m to 6 m.
Entrance hole size: approx. 12 x 12 cm. 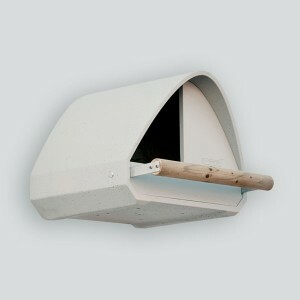 Brood chamber inside: W 30 x H 34 x D 30 cm. 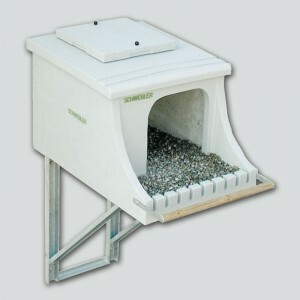 Includes: Nest box, hanger, hook, two mounting blocks and bedding.